Forty-seven cars will race at the 57th edition of Daytona 24 Hours, the greatest North American sports car endurance race that was established at Daytona International Speedway back in 1962 and it was held in the 24-hour format for the first time in 1966. This year, between January 24 and January 27, the race is again the opening round of the IMSA WeatherTech SportsCar Championship, in a year when IMSA is celebrating its 50th anniversary, but it also attracts many drivers from all over the world who are not regulars in the IMSA Championship. The greatest names among them are definitely last year’s Le Mans 24h winner and two-time F1 champion Fernando Alonso and his Toyota teammate Kamui Kobayashi, who is the fastest man ever at the famous Le Mans circuit. Alonso and Kobayashi will join Jordan Taylor and Renger van der Zande in the #10 Konica Minolta Cadillac DPi of Wayne Taylor Racing. 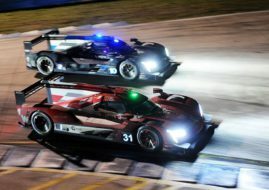 That car would be just one of eleven entries in the Daytona Prototype International (DPi) class, next to five more Cadillacs and five cars of Japanese brands – Mazda (two), Acura (two) and Nissan (one). According to new rules for 2019, DPi cars were divided from LMP2 cars that were represented by four entries. The GT grid is much bigger, with nine GTE cars in GTLM class and twenty-three GT3 entries in GTD class. All the winners from last year are again on the entry list. Last year’s overall winners Filipe Albuquerque, Joao Barbosa and Christian Fittipaldi will share the #5 Mustang Sampling Cadillac again, with a help of fourth co-driver Mike Conway, who finished second in 2018. In GTLM class, Ryan Briscoe, Richard Westbrook and Scott Dixon will try to defend their last year’s win in the #67 Ford GT of Ford Chip Ganassi Racing, fighting against the field of eight more GTE cars from five brands. #67 Ford GT – could it win one more time? The biggest fight is to expect in GTD class because of the most cars on the grid. GRT Grasser Racing Team took the GTD class victory in 2018 with the #11 Lamborghini Huracan GT3. The same car is again on the grid with three of four drivers from last year’s victorious race – Mirko Bortolotti, Rolf Ineichen and Rik Breukers. The fourth driver would be experienced Christian Engelhart. Eight manufacturers are represented in GTD class, with more than 90 drivers listed. The crew which we will cheer up is the all-female crew in the #57 Acura NSX GT3, featuring Katherine Legge, Ana Beatriz, Simona de Silvestro and Christina Nielsen as drivers.